NEW YORK —Uberchic met ubergeek at Lincoln Center Sunday. That bearded man taking a bow with Diane von Furstenberg at her spring show Sunday was none other than Google cofounder Sergey Brin. And the quirky, half-glasses that they were wearing? 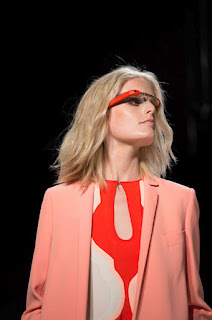 Glass by Google — a new technology that brings the digital world to the user and tries to stay out of the way. Models took to the runway sporting the peculiar, lightweight invention that allows for hands-free recording, photo viewing and a host of other functions. Brin may be the world's 24th-richest person with a fortune of $18.7 billion, but this is the first time he's shown up on the fashion radar and the crowd largely didn't recognize him among the crowd's other boldfaced names including Sarah Jessica Parker, Andy Cohen, Oscar de la Renta, Fran Lebowitz, Valentino and von Furstenberg's husband, Barry Diller. Backstage, hordes of fashion press and industry types clamored for a shot of Parker and Cohen. The trim, neatly dressed Brin — who wore an Alexander McQueen blazer with a white shirt over dark Acne jeans — stood somewhat apart, fielding questions from only a few reporters. “It's been under development for over two years now, and the goal is to really connect you to digital life without really taking you away from real life,” Brin said. It looked like he was wearing a pair of sporty blue-and-gray sunglasses without the lenses. High fashion it's not, but Google's effort to make a world of semicyborgs is relatively unobtrusive with just a small square glass piece that hangs in front of the wearer's right eye and functions as a screen. The device, which will sell for something less than $1,500, will likely include navigation functionality and photo capabilities when it hits the market next year. Google spent the last week capturing DVF's creative process with the glasses and a short film, “DVF Through Glass,” will be released Thursday on the designer's Google+ page and Google's YouTube channel. It's nothing new for brands from outside fashion to try to capture some of the industry's glamour and luster to get their message across — just look at the slew of stalls set up inside the tents at Lincoln Center. Google is a case apart, though, with a big enough share of the spotlight, all the financial resources a company could want and direct connections with consumers to promote new products. But with Glass, Google is trying to reach beyond its core. The 39-year-old executive said he's been focusing on Glass, but that there are other things in the works that could intersect with the industry. “There are many, many projects at Google where we've been really focusing on beauty and getting that going,” he said, declining to be more specific. In many ways, Google and DVF are a natural fit. Both are known for their willingness to experiment. And the tech titan and the fashion mainstay seem to have hit it off.